Introducing sustainable and accessible urbanism policies for the whole Gulf region by creating synergies and improving collaborations between Qatar University, government, industry and civil society will help secure the quality of its environment and the health of all citizens and visitors in the near and more far-off future. Qatar University’s specialist advisory scope in sustainable urbanism enables it to undertake advocacy and scoping, mapping and research studies to support all research and development. 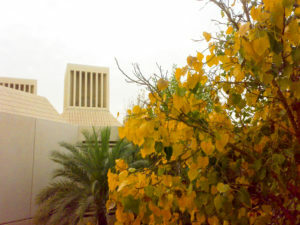 Yellow nature, Qatar University, Doha. Photo: SmSm, 2008. 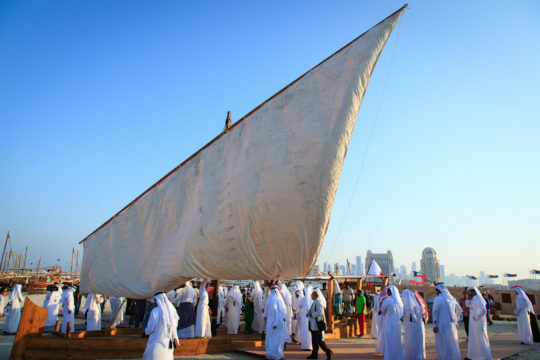 Unfurling sails for the 2nd traditional Dhow Festival, Katara Cultural Village, Doha, 2012. Photo © Omar Chatriwala. For all new medium and large scale development projects, through a new, specialist sustainable design review panel, undertake extensive evaluation of a. their socio-economic impact and b. feasibility in terms of environmental impact through baseline assessments. 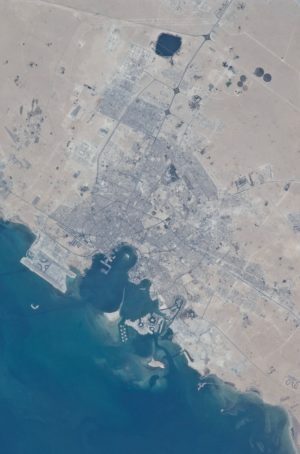 Doha City, Doha Bay, State of Qatar and the Persian Gulf, aerial view by NASA International Space Station , 2010. Image © NASA. Consider the set back distances of different land uses, and their features based on environmental criteria and potential nuisances. Make pedestrianisation and walkability a higher priority through the development of more shaded walkways, well located. Traffic calming measures through urban furniture/intelligent interactive design. Help to widen the range of alternative transport – bikes, roller blades, skateboards – in appropriate locations, for children, and biking paths for senior citizens. Institute one car-free day per month in a specific neighbourhood or neighbourhoods, with social events organised in the streets. Prioritise the development of open green spaces and landscaped plazas with benches to enrich the public realm and support its identity as a pleasant, car-free place for people to relax and meet. Analyse possible locations for new green urban infrastructure and shaded bike paths to help reduce traffic. Air pollution: studies to assess implementable measures to help boost citizens’ health. New tree planting policies: assess how to increase tree planting along roads and integrate waste water system and tree planting. A waste to energy plant as part of an integrated waste strategy which improves waste management. Analyse how best to build a recycling culture into the urban development process. A public information leaflet on neighbourhood consumer waste recycling. Produce an official developer guidance note on bioclimatic buildings, improved energy consumption advantages and the recycling of water for new planting of related landscapes. Build food security and change the local food legacy by assessing the types of organic foods that can be grown across the region, and existing producer spread. Offer start-up grants for new businesses in this field in areas of need, which will also help boost employment possibilities for young people in drylands food production and agricultural fields. 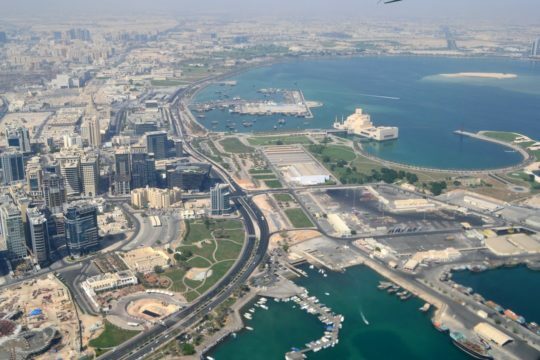 Doha, aerial view. Photo © Marc Desbordes. Consider the benefits of soil health and bio-diversity and processes by which this is achieved (composting, trees, mulching). Produce a public information leaflet for citizen guidance. Encourage beneficial community projects such as ‘Insect hotels’ run in local neighbourhoods. valuate how best to increase protection of wetlands and marshlands. Develop community workshops to involve local citizens in urban projects where they can learn and contribute their skills. Composting and gardening, recycling and biourbanism and blue (water) urbanism are key topics. These offer the opportunity for those with wide-ranging knowledge and skills to share these assets, and for sustainable urbanism education to be widened amongst community members in a relatively short timeframe. A community sustainable design panel can be formed from the workshops to operate alongside the specialist sustainable design review panel. An open-source website could be established, enabling all members of the workshops to feature their activities and post comments to enable shared intelligence.